SEOUL/PANMUN STATION, Dec. 26 (Joint Press Corps-Yonhap) -- South and North Korea held a symbolic groundbreaking ceremony Wednesday for an inter-Korean project to modernize and reconnect roads and railways across their heavily armed border. 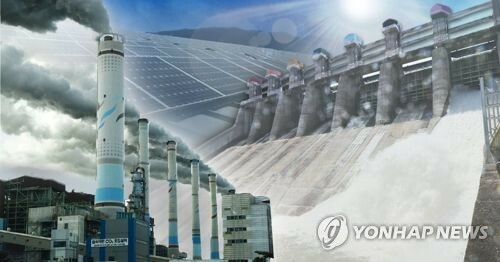 The ceremony started at Panmun Station in the North's border town of Kaesong at around 10 a.m. with high-ranking officials from the two Koreas on hand. A special train carrying some 100 South Korean participants arrived at the station earlier to attend the event. 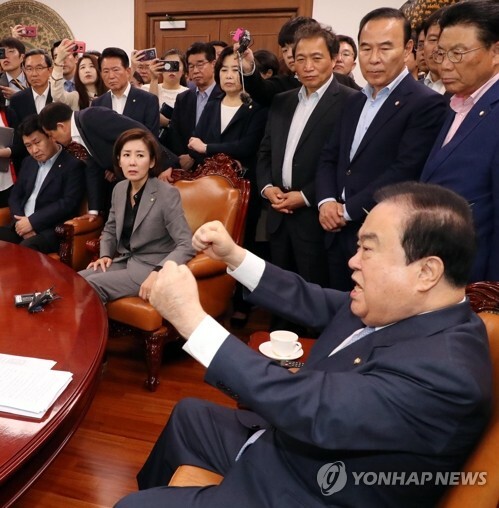 Transport Minister Kim Hyun-mee, Unification Minister Cho Myoung-gyon, parliamentary leaders, and other road and railway officials and experts were among them. 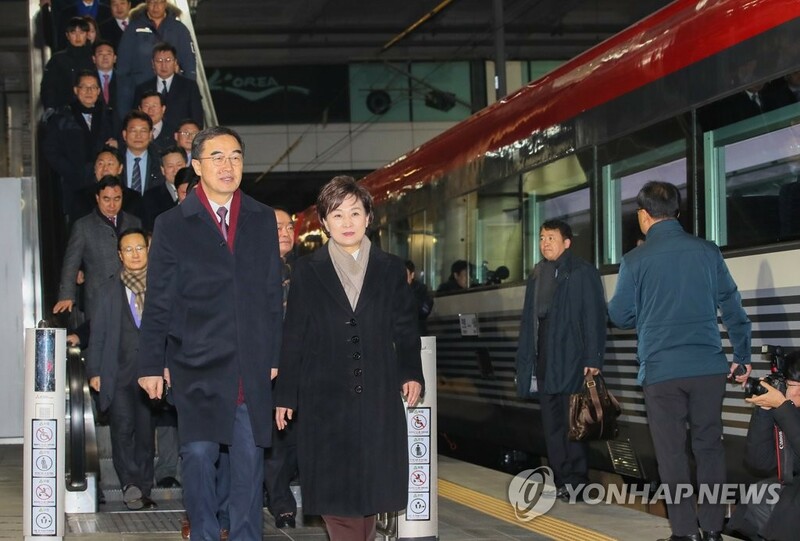 "The groundbreaking ceremony is meaningful in that it demonstrates the Koreas' willingness to actively cooperate on the modernization and connection project of their railways and roads going forward," the ministry said in a press release Monday. Officials from the United Nations and neighboring countries, including Russia, China and Mongolia, also attended the event that could be the start of an ambitious plan to connect the inter-Korean railway to the Trans Siberian Railway so as to create a transportation route from Korea all the way to Europe. 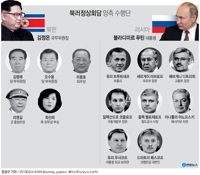 Ri Son-gwon, the chairman of North Korea's state agency in charge of inter-Korean ties, and Vice Railway Minister Kim Yun-hyok led North Korean participants in the event. The ceremony was comprised of celebratory speeches by representatives of the Koreas followed by such events as "track-linking," signing a railway sleeper and unveiling a signboard at the station, the ministry said. 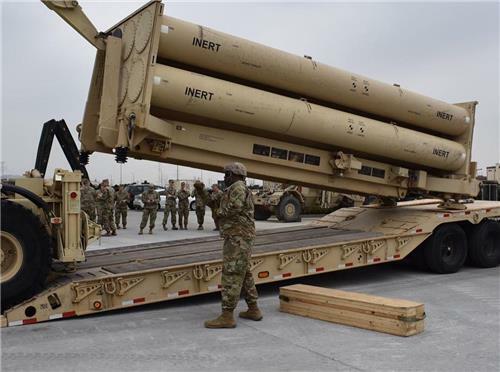 Seoul earlier received sanctions exemptions on materials and items needed to hold the event in the North through close consultations with Washington. 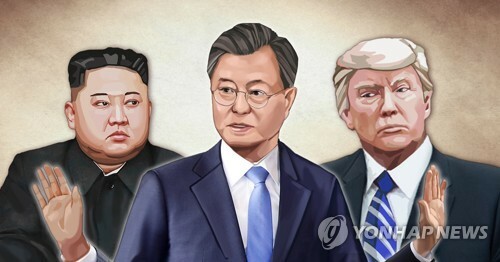 The groundbreaking ceremony came as the Koreas' leaders agreed in April to modernize and connect the roads and railways across their border, a project aimed at fostering balanced development and co-prosperity on the Korean Peninsula. 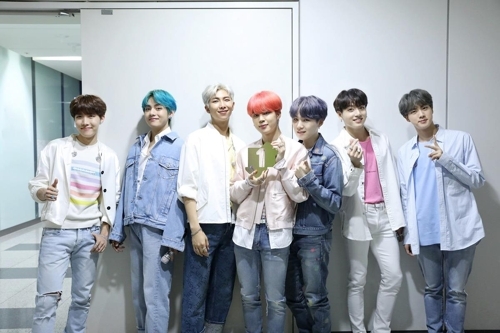 In their September summit, the leaders also promised to hold a groundbreaking ceremony for the project before the year's end. The Koreas have since been conducting joint inspections of the North's railways and roads despite delays caused by concerns over possible violations of sanctions against Pyongyang. They recently carried out an 18-day inspection of the North's railways in the western and eastern regions after the U.N. granted a sanctions waiver. The railway inspection marked the first of its kind since 2007, when the Koreas inspected a 412-km railway linking Kaesong to Sinuiju along the North's western area. This also marked the first time for a South Korean train to run from Mount Kumgang to the Tumen River on the North's east coast since the peninsula was divided following the 1950-53 Korean War. The groundbreaking ceremony is regarded to be a symbolic launch of the road and railway project, not an actual start of construction considering the ongoing denuclearization talks and existing multilayered sanctions on North Korea. "The government will carry out additional, in-depth (on-site) inspections, draw up blueprints and designs going forward following the ceremony," the ministry said. "The actual construction will be pursued in line with situations related to the North's denuclearization and global sanctions against North Korea."